LOW FARE airline Jet2.com has announced new routes from Larnaca and Paphos to Manchester from just €90.99. The two new direct flights bring to six the total number of routes offered by the company from Cyprus, following the existing routes from Paphos to East Midlands, Newcastle and Leeds and from Larnaca to Leeds. Tickets are on sale now for summer 2011 for all routes. The €90.99 offer applies to one-way tickets including taxes. Flights to Manchester from Paphos will begin operating on April 6, 2011, flying every Wednesday and Sunday during the season. Flights from Larnaca to Manchester commence May 14 and operate once a week on Saturdays. “We are delighted to confirm the expansion of our routes from Cyprus with these two exciting new routes to Manchester. 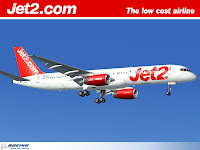 These routes not only allow the people in and around Manchester to easily access the ever-popular island of Cyprus but will also allow residents on the island to experience a low cost, fast and efficient, award-winning service back to the UK with Jet2.com,” said Jet2.com boss Philip Meeson. According to the press announcement, Manchester is considered one of the liveliest cities in Britain, offering “two premiership football teams, fantastic shopping, museums, restaurants, bars and some of the best music to come out of Britain”. The city also provides easy access to some of the UK’s most beautiful rural scenery such as the Lake District, which can be accessed by road or train within an hour.